Blowout Sale! 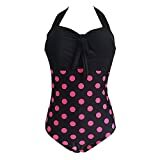 Up to 60% off on Swimsuits & Cover Ups at Femi Store. Top brands include FORTULY, Spmor, Seafolly, Aoliks, Norma Kamali, Jessica Simpson, Robin Piccone, Jets by Jessika Allen, Heymiss, ZAFUL, Alenoss, Betticoo, JINTING, Angerella, True Fit, Gottex, Afibi, & Gloria&Sarah. Hurry! Limited time offers. Offers valid only while supplies last.